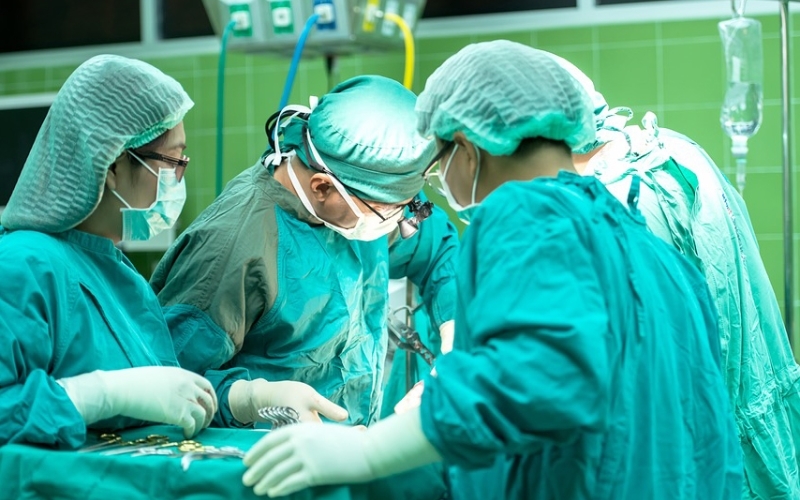 A team from UCL, University College London Hospitals (UCLH) and Great Ormond Street Hospital (GOSH) has operated on the abnormally developed spinal cords of two babies in the womb, in a medical first for the UK. The team repaired the defect in the spine of two babies with open spina bifida, in separate operations this summer. Mums and babies are recovering well. The operations brought together researchers from UCL working with NHS clinicians from UCLH and GOSH in partnership with University Hospitals Leuven in Belgium to carry out the operations in the UK for the first time. Until now, mums could choose to have the fetal surgery abroad or have postnatal surgery after the baby is born, which is the current practice in the UK. This specialist fetal surgery will give the baby a significantly better chance in life, as compared to postnatal surgery, as babies with spina bifida are very often incapable of walking, and may require a series of operations to drain fluid from the brain (shunt placement) later in life. "In spina bifida, the spinal canal does not close completely in the womb, leaving the spinal cord exposed from an early stage in pregnancy. This results in changes to the brain, as well as severe permanent damage to the nerves on the lower half of the body," said lead neurosurgeon Dominic Thompson of GOSH. "Operating in the womb involves opening the uterus, exposing the spina bifida without delivering the baby, closing the defect and then repairing the uterus to leave the baby safely inside", said lead fetal surgeon Jan Deprest of UCLH and Leuven. "Closure of spina bifida in the womb using this method is an alternative to postnatal surgery, and has been shown to improve short and medium-term outcomes. While neither intervention is fully curative, in fetal surgery, the defect is closed earlier, which prevents damage to the spinal cord in the last third of pregnancy. We are also researching the minimal access (fetoscopic) technique through the GIFT-Surg Project framework and, if we can show it to have equal benefit, we will be offering this option to patients." The UCLH and GOSH team has been training with Professor Deprest and his team in Belgium, where more than 40 operations, some on English patients from UCLH, have been conducted since 2012. They have also benefited from close links with the Children's Hospital of Philadelphia where the team led by N Scott Adzick pioneered this operation and has conducted more than 320 similar operations since 2011. The 30-strong team involved in the first two operations was coordinated by fetal medicine consultant Anna David (UCL Institute for Women's Health) and UCLH. Professor David, who is also supported by the National Institute for Health Research (NIHR) UCLH Biomedical Research Centre, said: "We have been working for three years to bring this service to UK patients through the creation of a Centre for Prenatal Therapy at UCL, UCLH and GOSH. "Our resolve to offer this service was based on the findings of a large, multicentre, randomised control trial in the US which compared prenatal closure to postnatal closure, and the observation that fetal surgery could be safely reproduced in Europe by proper training. "The US trial authors found that prenatal closure was associated with a 50% reduction in the need for surgical shunt placement in the newborn baby and a significant improvement in motor function at 30 months of age. "The reduction in need for shunts is particularly important," said Professor Paolo De Coppi (UCL Great Ormond Street Institute of Child Health), "as long-term follow-up of children that have undergone prenatal closure in the womb suggests that brain function, mobility, and total independence were higher in non-shunted than shunted children aged 5." Prof De Coppi is supported by the NIHR GOSH Biomedical Research Centre. "The Centre for Prenatal Therapy programme at UCLH and GOSH has been made possible thanks to generous charitable funding totalling £450,000 from GOSH Children's Charity and UCLH Charity," said Professor Donald Peebles, UCLH clinical director for Women's Health. "These vital funds have provided training for the surgical team and will fund surgery for the first 10 patients. While we currently only perform an open fetal surgery approach, we are developing the fetoscopic approach in pre-clinical models and hope this could further minimise maternal complications." The GIFT-Surg project aims to develop new fetoscopic tools and imaging techniques to support prenatal therapy, and is funded by the Wellcome Trust and the Engineering and Physical Sciences Research Council (EPSRC).